BLOOMINGTON, I.N. 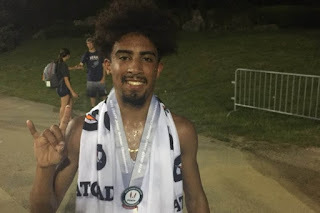 -- University at Buffalo distance runner Oscar Vazquez finished fifth in the men's 10,000m at the USATF Junior Nationals at Indiana University over the weekend. His time of 33:22.76 was just six seconds shy of qualifying for the 2018 IAAF World U20 Championships. Also competing over the weekend were Thomas Flannery in the men's 5,000m and Christopher Nowak in the men's 1,500m. Flannery finished 9th in the 5,000m with a time of 15:38.67. Nowak finished 11th in the 1,500m with a time of 4:08.71.